Lee Turner (left) and his brother Brandon Turner (right) with farm equipment on their recently-purchased farm, Scioto Prairie Farms, in Auglaize County. WAYNESFIELD — Brothers Lee and Brandon Turner are springing into their first fiscal year operating Scioto Prairie Farms in Auglaize County. Although both are in their twenties, they certainly aren’t new to the farming business. Working with their mother and father, the Turner brothers have taken over a neighboring farm, about double the size of their family farm in Waynesfield. Their neighbor retired and his children were not interested in taking over the farm. The Turner family had done a lot of agricultural work for their neighbor in the past. They chose the name Scioto Prairie Farms because they “farmed quite a bit around the Scioto River and ever since we’ve grown up everybody has called this area The Prairie because it’s so flat,” said Lee. Along with the land, the Turners acquired farm equipment, including a combine, which they have never owned before, a bigger planter that will keep up with the bigger tractor, and other equipment. Lee said that “staying ahead of the game” with agricultural technology is a challenge. “It just keeps getting harder and harder to stay ahead. The tools are there to help you succeed,” although he admitted that equipment is becoming more expensive. Purchasing the land was a two-year process, according to Lee. There was a lot of farm credit that they needed to start the corporation, as well. Lee and Brandon are both college alumni of Wilmington College. Lee graduated with a degree in agronomy and a minor in agricultural business in 2016, and Brandon graduated with an agricultural business degree in 2017. Both brothers attended Waynesfield Goshen, where they played football and showed livestock. Lee and Brandon’s father was an agriculture teacher. Their mother is from Michigan and did not grow up on a farm. She met their father at The Ohio State University. Lee and Brandon’s father farmed with his own father and started the Turner family farm business in the early 1990s. From then until 2017 they grew popcorn and soybeans. According to Lee, the demand for popcorn dwindled and so they switched to growing corn and soybeans. “We’d like to get back into popcorn again some day,” said Lee. “We actually have a young staff,” referring to their two full-time employees who are both in their twenties. They also employ some part-time seasonal help. “It’s always good to hire young people and get them involved. It just adds another thing that we like to do,” said Lee. “I’ve always liked rural community…and we’ve always enjoyed helping out area farmers and try to be involved in the community,” said Lee, explaining that he has been on the Auglaize County Farm Bureau board for two years and this year he joined the Auglaize Soil and Water Conservation District board. 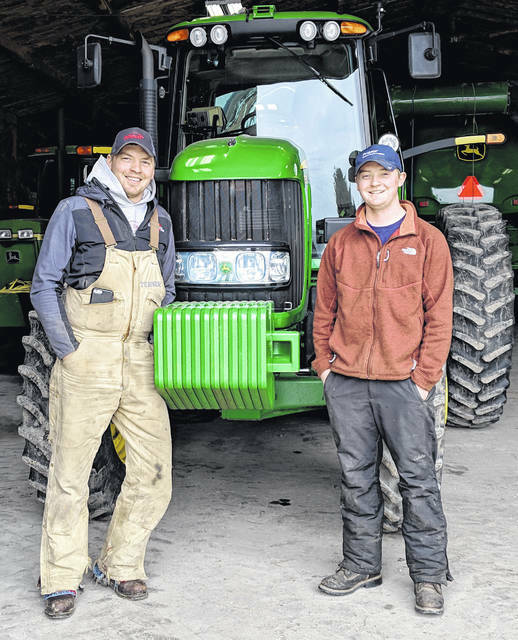 https://www.rurallifetoday.com/wp-content/uploads/sites/56/2019/04/web1_TurnerBrothers.jpgLee Turner (left) and his brother Brandon Turner (right) with farm equipment on their recently-purchased farm, Scioto Prairie Farms, in Auglaize County.